Raed Tawil with his child. UPDATE: Today we’ve just learned that Raed Al-Tawil is being subjected to monstrous torture and that he is being held in Al-Khatib state security branch in Damascus. 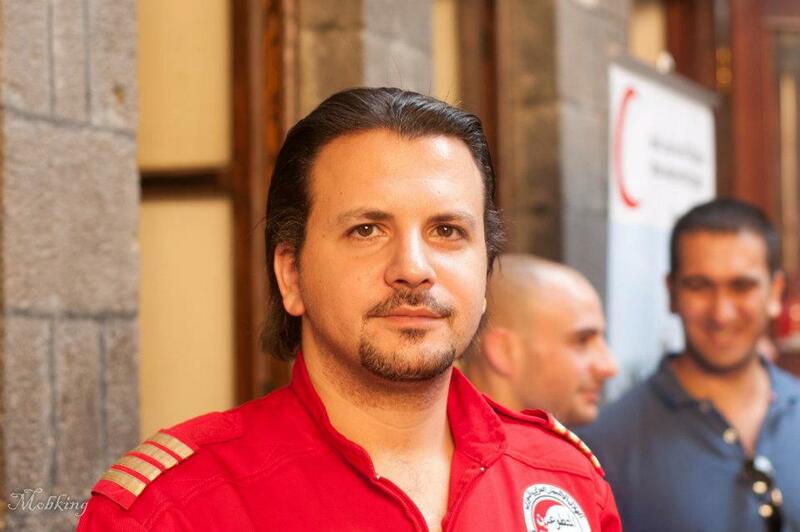 Syrian security forces have arrested Muhammad Raed Al-Tawil, a red-crescent volunteer, on Thursday noon 8-11-2012 from the headquarters of the Damascus branch of the Syrian Red Crescent where he works. No reasons were known for such arrest. 36 year-old Al-Tawil is married with one child and has been volunteering for the Syrian Red Crescent for more than 18 years. He is a board member of Damascus branch and had contributed in the responsive process management to the Zinzun dam disaster 2002, the war on Iraq 2003 and the 2006 Lebanon War. Before his arrest, Al-Tawil was managing the emergency service provided by the Syrian Red Crescent to all parties, committing by doing so to the principle of neutrality. Al-Tawil suffers from a previous injury in the back due to a previous mission and hence he is in constant need of medical care and medications. No information has yet come to light on Al-Tawil’s whereabouts or how he is being treated inside his detention cell which raises serious concerns about his safety and life, especially that the charges against him are still unknown. We call on the Syrian authorities to disclose full information on the fate of Muhammad Raed Al-Tawil and to release him immediately and unconditionally along with all prisoners and detainees in Syria. Freedom to Raed, freedom to all Syria detainees! Please sign and share our petition calling for Raed’s freedom along with the rest of Syria’s paramedic. Finally I want to thank the Gulf Center for Human Rights for supporting our call to free our beloved friend Raed Al-Tawil.